I know, I’m boring everybody with my peans about my beloved halogen oven… but truth is, its awesome equipment. I learned to use it quite well – ask Cookies about Xmas turkey (post coming soon!) ;-). Since the halogen oven is not too big, plus I can’t find here right size baking forms and I like to eat some cakes 😛 yeah, beats me too 0_o. I went to the store I hate the most (only one open at the time) and believe me or not I found french dough on sale. Of course I have halogen oven now so I bought 2 big rolls. Then every time I looked into the fridge I saw it there screaming at me to use it, but I never did before and couldn’t get my head into it. Most of the recipes I found needed baking dish I didn’t have. Some time passed and I still didn’t have idea what to do… One Sunday, I think the last before the dough expired I decided I can’t wait no longer and I have to take the bull by his horns… I took it out of the fridge and kept looking at the shelfs what I can make with it… Drawer? Carrots… peppers… celery root… piece of ginger… nah not a dessert material.. Shelf above? Pickles, mayo, stuffed olives… DAMN!!! 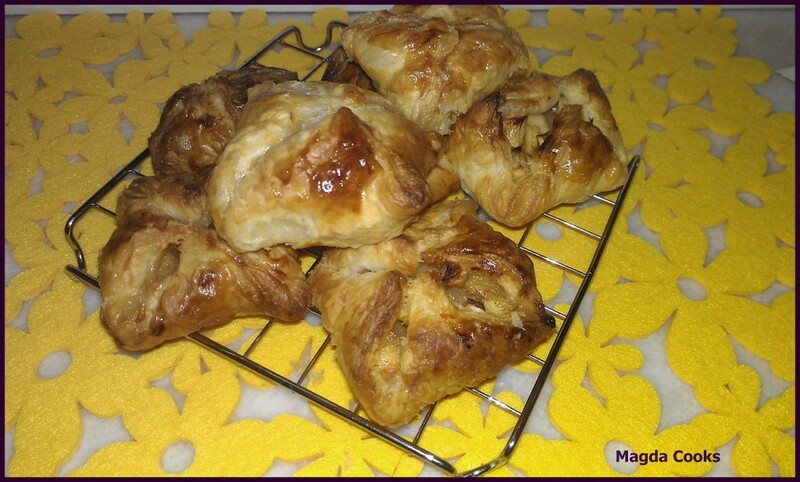 Then I got enlightenment… There was apples inside… More painful thinking and I had it all figured out 😉 my own recipe for french dough apple filled pouches. Peel apples, cut the cores and dice into small pieces, put into bowl, sprinkle with right amount of brown sugar and cinnamon, set aside. Preheat your oven, or if you have one, your halogen oven to 200C 0_o. Open dough and cut into 12 rectangular pieces. On each flat piece place enough apples to be able to create an envelope style pouch. Coat with beaten egg. Bake for about 18-20 minutes or until pouches are golden brown. Don’t worry if they open, it doesn’t make them less tasty! !